When it comes to watches, I am a truly believer in saving up for classic luxury watches. There is no shortage of pricey watches out there but somehow these pieces just don't stand the test of time. I received my first Rolex from savvy parents and must say I didn't really appreciate the watch until last few years. Perhaps I grew into my Rolex but I must say the style was like mom's cooking. This gal just don't grow tire of it. Pricey fun watches on the other hand is a total waste of money, in my humble opinion. After a while, these pieces just become old but too expensive to toss. You can forget selling them too because resale value is low. 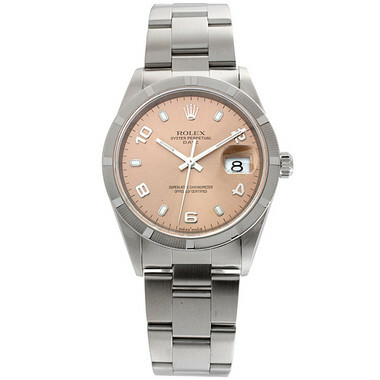 If I have a chance to buy a new Rolex, the one above (in the medium size) will be my top choice. A gal pal purchased one about 8 years ago and I still look at her with envy every time I see her wear it. This, in my opinion, is a savvy investment. What about you, what is your dream luxury watch? I have a luxury watch that I inherited from my mother --- it is has a beautiful diamond wrist band and diamonds all around the face, keeps time beautifully--- not ostentatious looks more like a pretty delicate bracelet. I know a couple of people who have had terrible trouble with their Rolexes. My mother's is always losing time, having to be sent away for months for expensive repairs, only to come back and start losing time again...maybe she's just been unlucky. I have a couple of Hermes watches that I recently started wearing again. Sometimes I think of saving up for a fine timepiece, but then I remember that I want one as a wedding gift. It would be too depressing for me to buy my own. I never liked Rolos personally, always a Tag girl. My dad had a gorgeous Tag Carerra, that I dreamed to inherit, but he ended up selling it. that Rolex is dream worthy...maybe someday! My tastes (and budget) might change in time and make me covet a gorgeous classic luxury watch. For now though, I'm very particular about the sort of watch I want, and that is one with a simple but large round clock face and a leather strap. Luckily for me, I found one that I love that isn't expensive at all: the Timex I posted about today. I'm a Cartier girl all the way and will stick with them for the rest of my life. The Santos I am wearing right now is more than 10 years old and I still get compliments on it. Not a fan of Rolex at all...unless it's a vintage kind. I also love Jaeger LeCoultre. As far as classic vs. trendy...I stick with classic. I don't need anything from Jacob the Jeweler...lol! Or Franck Muller. Nooooo....don't buy a new Rolex, buy a gently used Rolex and put the money that you save into an investment! Do you think it is worth investing in a Chanel J12 watch? Hi, I hear good and bad things at the Chanel J12. Some pals think they are not worth it but others love it. It is all up to you. Personally for investment pieces, I usually will only buy from serious watch makers. I do have a couple of Chanel watches but I consider them fashion pieces.